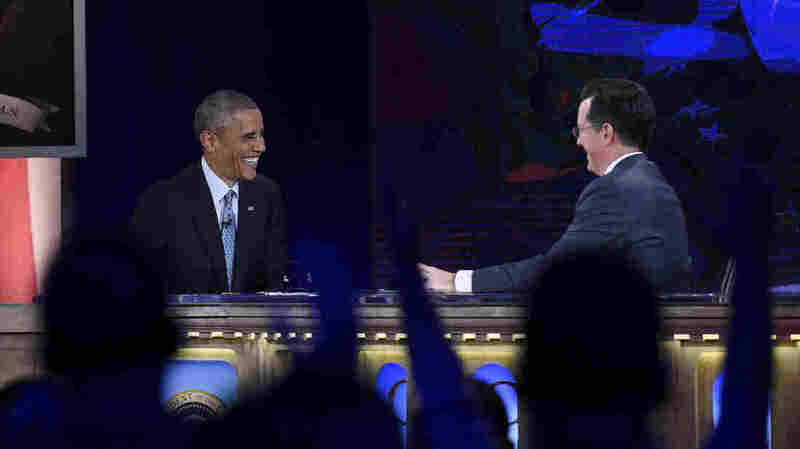 Obama Meets Colbert: 6 Unbuttoned Moments : It's All Politics President Obama briefly hosted comedian Stephen Colbert's show Monday, declaring, "How hard can this be?" President Obama, appearing on The Colbert Report, said, "Look, the election didn't go as it, uh — as I would have liked. You notice, I made a little correction there, I had a little thought bubble." When President Obama sat down with comedian Stephen Colbert Monday, he didn't actually loosen his necktie. But we saw a relaxed president with just two years left on the clock, playing to a receptive audience of nearly 1,500. Obama playfully took Colbert's seat on set at George Washington University, declaring, "Stephen, you've been taking a lot of shots at my job; I decided I'm going to go ahead and take a shot at yours. I want you to get out of the way, what part of the segment are we in now? What were you going to be doing?" He went on: "How hard can this be? I'm just going to say whatever you were about to say." 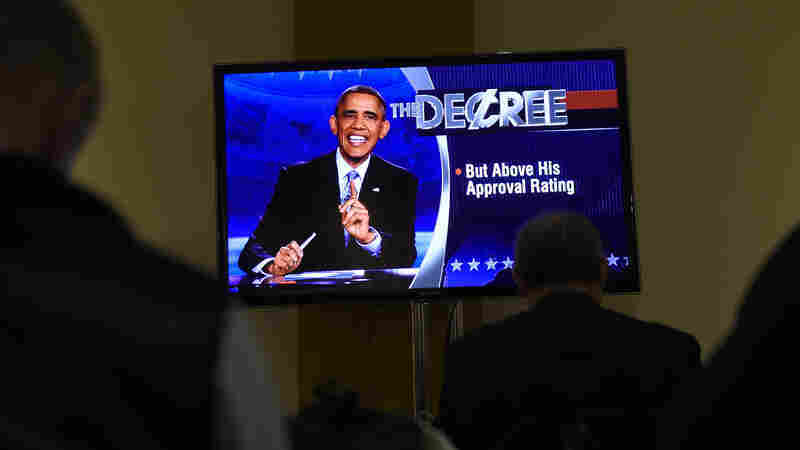 Taking over a Colbert Report segment he renamed "The Decree" (a more presidential version of regular segment "The Word"), Obama parodied Colbert saying: "Nation, as you know I, Stephen Colbert, have never cared for our president. The guy is so arrogant, I bet he talks about himself in the third person." 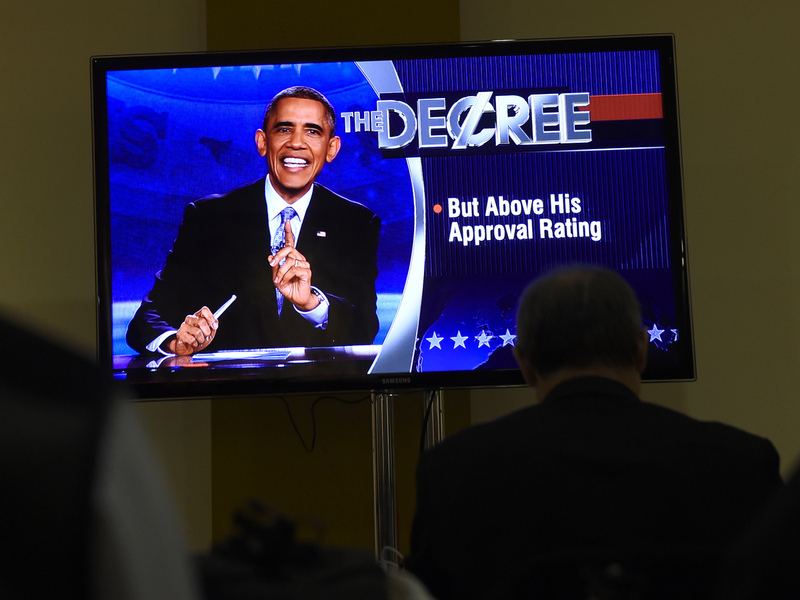 The president took over a segment renamed "The Decree" on The Colbert Report. "Look, the election didn't go as it, uh — as I would have liked. You notice, I made a little correction there, I had a little thought bubble. But, as president the only office where you're elected by people all across the country, you've still got a lot of responsibilities," Obama said. He, of course, added that he's still committed to working with Congress, helping working families get ahead, and making sure young people can afford college. Obama riffed on his signature his health law: "Now that Republicans control both the House and the Senate, they could pass a bill repealing Obamacare," he said to boos from the audience. But, he said, "the president still has the veto, and if I know that guy he is willing to use it." "Even if Republicans did somehow repeal it, they'd have to replace it with their own health care plan," he continued. "Once they touch it they own it. Then if anything goes wrong, suddenly, everyone will be complaining about Mitch McConnell-care." Asked if he liked the sound of "President Barack Obama," the president said no. "I love the job; it's an incredible privilege," he said. "But when you're in it, you're not thinking of it in terms of titles, you're thinking about how do you deliver for the American people." "Also, when I go home, Michelle, Malia and Sasha give me a hard time. There are no trumpets. And they tease me for my big ears or my stodgy suits." He went on to answer that even he leaves socks on the floor and no, that doesn't go over well. Colbert asked if the president knew the nuclear weapon launch code sequence. The president wouldn't go there. "Can you tell me if there's a 5 in there?" Colbert asked.